Cleaning up her piles of books that belonged to her aunt Catherine discovered a guide to the National Gallery of Victoria (NGV) from 1968, the year that it opened the St Kilda Road building. (Well, it is not yet an antique, but it soon will be.) This piece of ephemera is a portal to another time of art in Australia. 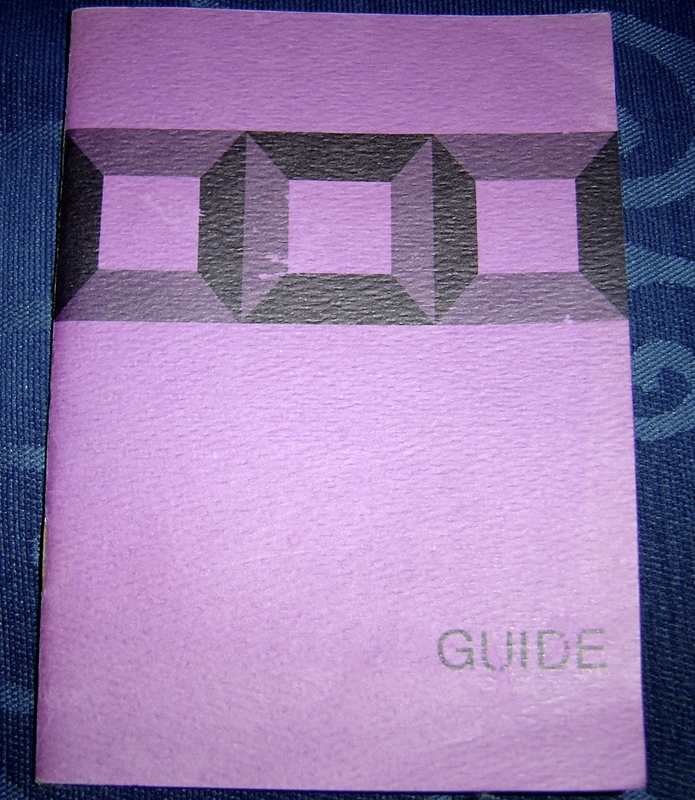 The guide is small booklet with a purple paper cover, stapled binding and 32 pages with black and white illustrations. Printed by the Aldine Press Pty Ltd., a commercial printer specialising in book and periodicals, still operating in Prahran. There is no price on the booklet but the cover does fold out to include a membership form for the Gallery Society. The purple cover has the stylised image of the roof of the gallery with the three central courtyards. In the plan of the gallery the courtyards are named both by the architect and after the donors: the oriental courtyard, named ‘Coles Court’; the sculpture courtyard, named ‘Lindsay Court’ and the ‘playhouse courtyard’ named ‘Keith Murdoch Court’. It starts with a dry introduction from Eric Westbrook, the then director of the NGV, mostly about the gallery’s benefactors. There are maps of the two floors of the gallery, showing the original layout of the exhibition space. The rest of the publication is an introduction with illustrations to the main areas of the galleries collection. It is interesting to note what is missing from the text. The term ‘ethnic art’ is used instead of ‘aboriginal art’. Reading about the European art collection it is remarkable to notice how much is about English art and that France is not mentioned, although the Impressionists are. The description of Australian art, then housed on the second floor of the St. Kilda Road gallery, clearly shows Australia’s ‘cultural cringe’. Many aspects of the NGV have changed but I did note that the galleries collection of William Blake drawings remains a consistent feature of the galleries exhibition of Prints and Drawings department; Blake’s “The Whirlwind (Angel Crossing Styx)” is illustrated on page 11 and his drawings were on exhibition again this year. This entry was posted on Monday, September 29th, 2014 at 11:46 PM	and tagged with aboriginal art, Australian art, guide book, Melbourne, National Gallery of Victoria, William Blake and posted in Art Galleries & Exhibitions, Art History. You can follow any responses to this entry through the RSS 2.0 feed. My daughter and I were just talking this weekend about how long the NGV has been in St Kilda road, so this discovery answers our question! Its fascinating to compare these old publications with the modern versions, so a really lucky find. Yes, an especially lucky find considering that it from the year that the NGV opened. Only a couple more years until the 50th anniversary of the building.